rarely, because lower tangent arc is most of time under the horizon. A dazzling lower tangent arc. There is a halo adjacent to the 22°-halo which can have different shapes. Its appearance changes subject to the sun elevation. At sun elevations of less than 32° this halo is called the upper and lower tangent arc to the 22°-halo, at sun elevations of more than 32° it is called the circumscribed halo. When the sun is low, the two “arms” of the upper tangent arc form a sharp angle. As the sun gets higher, they get closer and closer to the 22°-halo. At the same time they become longer, joining the lower tangent arc at a sun elevation of 32°. The complete ring now being formed is called the circumscribed halo. It touches the 22°-halo above and below the sun. First the circumscribed halo is of an oval shape. At increasing sun elevations its shape becomes more and more circular and gets closer to the 22°-halo. At a sun elevation of 70° the circumscribed halo almost covers the 22°-halo. Towards the sun its colour is reddish, while its outer rim is bluish. As well as the tangent arcs, the circumscribed halo has more intensive colours than the 22°-halo. The lower tangent arc is rarely to be seen in the sky because it is above the horizon only at sun elevations of more than 22°. 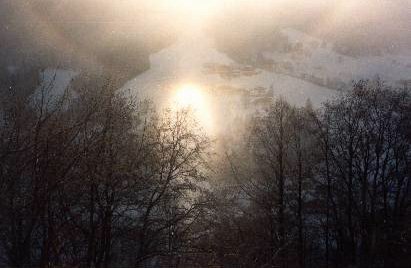 When the sun is lower than 22°, it is only visible in freezing fog or from an elevated observation point (e.g. from a mountain or a plane). Conversion of the tangent arcs to the circumscribed halo. The tangent arcs and the circumscribed halo are caused by horizontally orientated column-shaped crystals. The refraction angle is 60°. The light enters one face of the prism and leaves the next but one. That is the same path the light takes when there are parhelia or the 22°-halo. The different halos result only from the different orientation of the crystals.